Since prehistoric times the Japanese style of dress has been two pieces of material that were sewn together back to front and secured by a sash or cord. For warmth in winter, more layers were added. Although the origin of the kimono is unknown, authority Helen Minnich, author of Japanese Costume and the Makers of its Elegant Tradition, dates the appearance of the first kimono at around 660 B.C. The form that then existed has been modified over the years due to the influence of other Oriental countries as well as the attitudes of the various Japanese ruling dynasties. The text panels explain the ways in which developments during succeeding eras influenced fashion. During the Nara Era (646-794), for example, people were classified into different ranks and required to wear specific items of clothing. Only the nobles were allowed to wear kimonos. This sanction was tempered somewhat during the Heian-jidai Era during which the wealthy distinguished themselves by wearing elaborate and colorful layered kimonos. These were, in turn, subsequently replaced by the simpler, plain colored silk kimonos that dominated the harsh and pragmatic Kamakura Era. 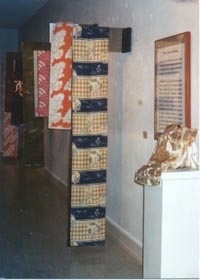 A wide sampling of kimonos, classified as to formality and occasion, are included in this display. The range of styles that is represented explains in large measure why this garment is popular today with all classes and has become a universal symbol of Japan. All kimonos are the same shape and are made in a standard size that can be worn by men or women. This gives the kimono a versatility not found in western dress. Kimono cloth is always straight and flat and the finished product can be taken apart and re-sewn as is done when a kimono is cleaned. 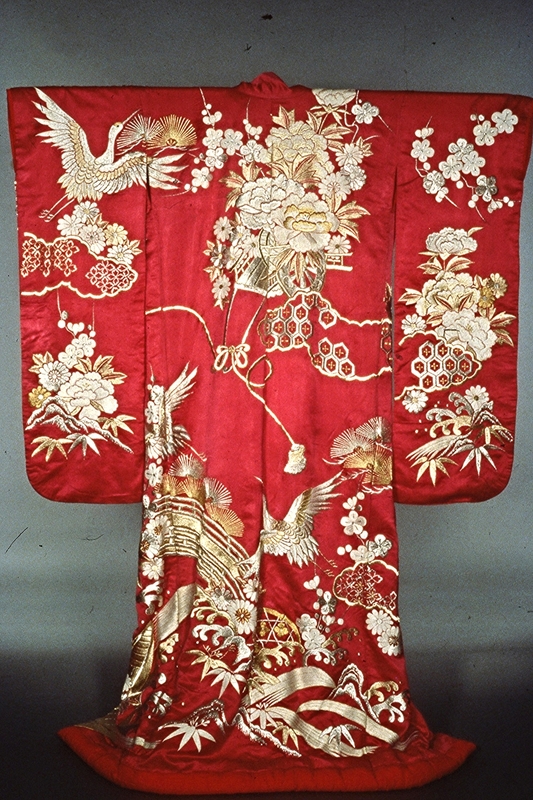 In addition to traditional kimonos from various eras, the display includes a heavy silk brocade robe, a red and pale green lined chartreuse crepe kimono, which is printed with birds and scrolling foliage, and a long robe printed with delicately colored flowering branches.